Secret Crisis is pretty much my version of a DC vs Marvel fighting game. After making D Fighter, I wanted to make another comic based fighting game. My original idea was to make another comic based fighter to follow it up. 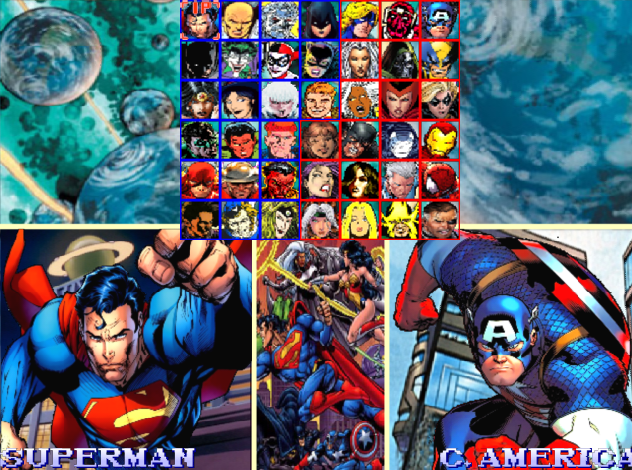 Early ideas were an expansion of D Fighter making an game featuring an all villian roster from Marvel and DC. After some thinking I made the decision to make a straight Marvel fighter, since most of the DC villians would be recycled from D Fighter. There were several people who said that the villians would not make sense without heroes, and I came to agree on that. The game was called "M Fighter: Uprising". I released a beta, but quickly lost interest. I worked on other projects, occasionally considering finishing it. This time I made a better gameplan, was able to get offers from some characters I really wanted to make (thanks Esn23), and got permission to use WizzyWhipitWonderful's epic mid 90's Capcom style music. My goal is to combine my D Fighter and M Fighter projects together. That way I can make many more Marvel characters, while I make a couple of DC characters I wanted to, but would not fulfill a full game. I'm going to go for the counterpart gimmick with character choices. I consider it at beta .5 right now. Even though it is fully playable, at this stage there are only a few new characters, although I have tweaked and aded moves for several characters. My main goal for this stage was to create all the main characters and set up a basic roster. All characters from the Marvel arcade games are similar, but more grounded in their attack style. Think of it as similar to the differences between Ryu in Street Fighter and Ryu in Marvel vs Capcom. Some characters, like Wolverine, just have their moves toned down, while characters like Spiral have their moves adjusted. The term "Secret Crisis" came from the old Amaglam comics, and looking back through my collection, I realize that this game is really "Official Handbook of the Marvel Universe" vs "DC Who's Who". Both of them were late 80's comic series that listed a ton of characters, and got me into comics. Going back through them, I remembered why I used to read the things in the first place. Despite the face that I've stopped buying comics, going through more my old ones was just fun. And being able to make any character, no matter how crazy they were, was why I made stuff like M Fighter in the first place. Crazy future space woman who used a giant green eye as a weapon. She's in! Why make War Machine and U.S. Agent when I already have Iron Man and Captain America? Because I loved and reread those copies of West Coast Avengers I got from the quarter bin. And hey is that a U.S. Agent beta that was released, I gotta get permission for those sprites. Comics may be taking themselves too seriously now and half of my favorite characters are probably dead now, but the old stuff has a lot of goofy campy stuff I loved. Kind of like a fighting game. To choose color #2 press Medium Punch. To choose color #3 press Hard Punch. To choose color #4 press Light Punch. To choose color #5 press Medium Punch. Pressing Start or Hard Kick will select a random pallete. Here is a quick list of the basic universal character properties. I'd compare the game feel I'm going for a similar to Street Fighter Alpha and Darkstalkers. All characters can chain attacks from light to heavy. Light juggling is possible, and a little looser than D Fighter. Scruffy Dragon Huge thanks to the ScruffyDragon/DC vs Marvel Mugen team from the message boards for the help and feedback. WizzyWhipitWonderful's Youtube channel WizzyWhipitWonderful makes some amazing Capcom CPS2 inspired compositions, which I used for the game. It really gives it a good mid 90's Capcom feel. Check out his youtube channel and the Mugen game X-Men: Second coming for more of his awesome work.